Go, Tracy, Go! : My weekend was better than yours. Or maybe my weekend wasn't better than yours. It's not a contest. But my weekend had some highlights, and here they are. For this blog post, I did my weekend up legit blogger style with a bajillion pictures that only have meaning to me and are posted to show you how awesome I am and that I will now dump in this blog with as few words as I can. Added bonus: at least one of the WORST PICTURES EVER TAKEN OF ME. 15m run with Emily. Finally! A long run longer than 13m! But we have no blog photo skills, so the photo was dark. Emily offered to run with her DSLR next time. Did you know that Manhattan has a monument to the Irish potato famine? They do. And I made Emily take a photo of me standing in it. A lot of bloggers seem oddly keen on taking photos with their Starbucks. Emily offered to take one of me. I look ridiculous. I'm laughing at the absurdity. Then we went for brunch. This being NYC, a film crew walked into the diner and started talking to an older couple. We asked the waiter who they were with and he said that the restaurant didn't know - they just came in and did their thing. I'd been looking forward to Sunday for some time - my former training partner Tamara was in town from Canada! Tam is more than a training partner. Imagine spending the first hour of your day talking to someone, nearly every day for two years. When you meet someone and click with them as training partners and friends like we did, it's amazing. It had been far too long, and we had a lot of major life changes to catch up on over 6m. The funniest part is that I was subtly trying to sneak out my camera to ask her if I could take a photo when she insisted that we do. She wanted to be on my blog! Random trivia: she and I actually met on the internet, but way back in the prehistoric early 21st century. 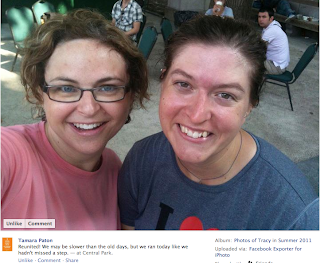 Because this is a vanity post, here's another photo taken after the run/walk (...should have been a run, totally my fault), shamelessly stolen from her facebook page. I did almost nothing. 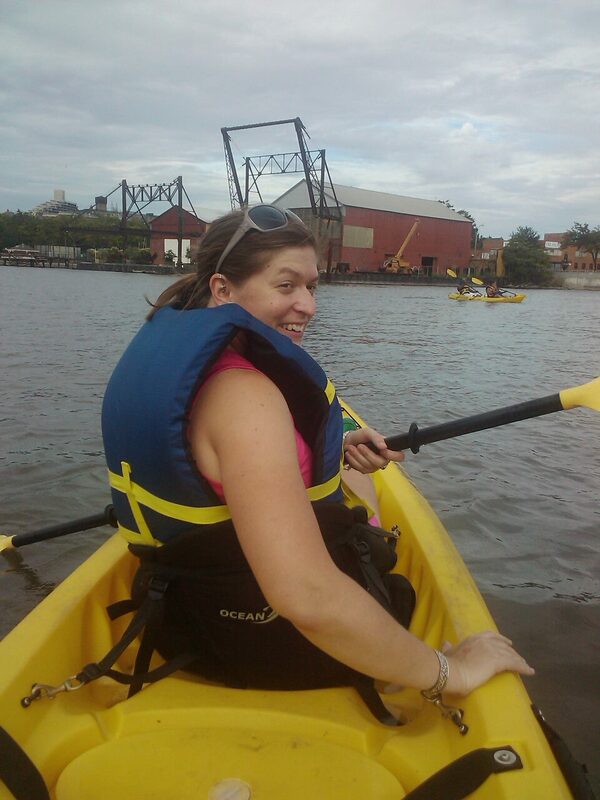 Oh, yes, unless you count kayaking in the East River as nothing! this post totally made my day. my photography skills are amazing and you look great drinking your iced tea. Your blogger photo dump is not legit because there was no iced coffee, nor were there oats. BUT yeah you guys are super cute, and I want to kayak! East river? where do I go? I demand more Starbuck and Potato Famine Monument photos!